Let there be light on your laptop keyboard! Now, you can type on your notebook or laptop even during a power failure or when someone beside you is already sleeping. 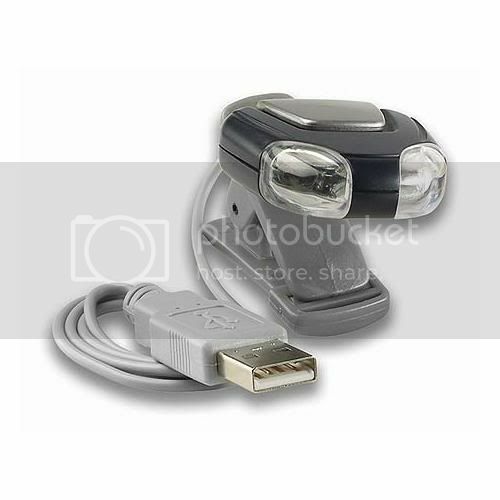 The USB computer light from Lewis N Clark is a very useful device while traveling and chronicling your experiences. It illuminates your notebook keyboard in dark areas or in dimly lit places. It has a clip that fastens onto your laptop frame so that wherever you place your laptop the light stays. You can also pivot the USB computer light to provide illumination wherever you need it. It does not require an external power source. You simply connect the USB connector to any available USB port on your laptop. The Lewis N Clark computer light includes two very bright LED lights and promises to last for hours. And though this is commonly used with laptops, you can also use this for your desktops, as well, or even on any other activity that would necessitate private light in dark areas. So the next time the lights are turned off on the plane and you desperately want to continue with your work or read a book, just clip it on, hassle-free.